For the past fifty years the view has prevailed, shared by politicians on the left and the right, that society is sustained by two institution, the market and government, the homes, respectively, of individual and the state. This has led to the breakdown of third sector institutions like the family and the community, places where we find identity, meaning, security and trust. 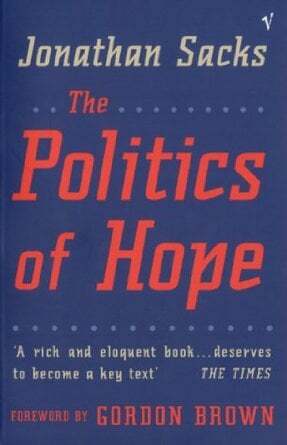 In The Politics of Hope Jonathan Sacks proposes a new understanding of society, based on covenant as well as contract. This, he argues, creates a new politics of responsibility in which families, neighbourhoods, communities, voluntary organisations and religious groups all have a part to play. How, he asks, do we move from social breakdown to the politics of hope?